Gas Central Heating & Double Glazing. A well presented double fronted ground floor flat situated with level access to the town centre, train station and seafront. The property has two good size bedrooms and benefits from its own low maintenance rear garden. This gas centrally heated and uPVC double glazed property comprises: bay fronted living room, modern fitted kitchen and bathroom with a white suite. Exmouth is part of the coastline known as the "Jurassic Coast" which has a lovely stretch of sandy beach and a Marina. 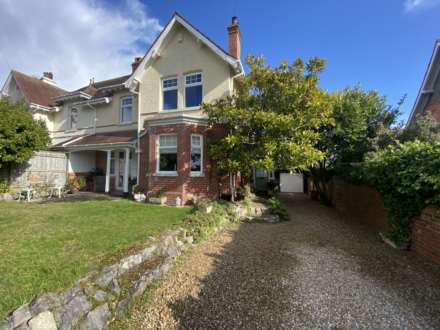 There are further beaches nearby including Budleigh Salterton, Sidmouth and Lyme Regis. Exmouth town centre has a variety of local shops, pubs and restaurants, and regular bus and train services to Exeter City which is approximately 10 miles distance. An attractive bay fronted living room with a focal fireplace incorporating a wood burning stove. Double glazed bay window to front aspect. Central heating radiator. Coving to ceiling. Television point. Telephone point. uPVC double glazed door giving access to the rear garden. Under stairs cupboard. Built in linen cupboard with slatted shelving. Inset spotlights to ceiling. Doors to bedrooms and bathroom. Double glazed window to front aspect. Central heating radiator. Coving to ceiling. Television point. Double glazed window to rear aspect. Central heating radiator. Television point. White suite comprising: Corner bath with shower attachment and electric shower over. Wash hand basing set in a vanity style unit with cupboard beneath, fitted mirror and light over. Low level WC. Heated ladder rail. Inset spotlights to ceiling. Extractor fan. Coving to ceiling. To the front of the property there is an enclosed fenced front garden, with a pathway leading to the front door. There is an enclosed rear patio garden which provides an ideal area for outdoor dining and sitting during finer weather, and suitable for pots, tubs planters etc. Garden Store. The property is FREEHOLD with the first floor flat held on a long lease. Maintenance is a half share when required. Council tax band A. These are draft particulars awaiting vendors verification. From our prominent town centre office turn right down Rolle Street and take the 2nd exit at the roundabout into The Parade. Continue along into Exeter Road, turning left by All Saints Church into Church Road. Take 2nd right into Rosebery Road where the property will be found on the left hand side and clearly identified by our For Sale board.